The Greensboro History Collections showcase documents, photographs, and publications related to the history of Greensboro and the North Carolina Piedmont, culled from multiple collections belonging to the Martha Blakeney Hodges Special Collections and University Archives, the Greensboro Historical Museum, and other local community partners. These collections include newspapers, photos, city directories, and other materials. All known runaway or fugitive slave advertisements published in North Carolina newspapers through 1840. Including all known issues of The Greensboro Patriot published from 1826 to 1922 and the newspapers published at Greensboro's ORD/BTC-10 army base during World War II. A community's history lives in the files and records of its smaller organizations. UNCG works with many community groups (schools, churches, neighborhood associations, and even individuals) to make some of this history available online. Material from UNCG and community partners tracing the history of medical practice in Greensboro and Guilford County. Over 175,000 pages of material documenting Greensboro from Reconstruction through World War II, focusing on the influences of the textile industry, education, and the military. Useful for genealogical or building research, these directories list businesses and individuals, and many are corss-referenced by address and telephone number. Civil Rights Greensboro provides access to archival resources documenting the modern civil rights era in Greensboro, North Carolina, from the 1940s to the early 1980s. Documents, maps, photographs, and other material related to Greensboro's physical growth, inclduding subjects such as urban renewal, historic districts, and urban planning. Oral history interviews with notable Greensboro residents. Yearbooks, photos, newspapers, bulletins and catalogs. N.C. State University architecture digital collection. Documenting Winston-Salem and Forsyth County through historical photos. Newspapers, yearbooks, memorabilia and more. Documenting the history of Guilford College and the Quaker community in Greensboro. Collections from the State Library and State Archives of North Carolina. From the University of North Carolina at Chapel Hill. Collections documenting the university and beyond. A wide variety of collections on many aspects of community and church history. 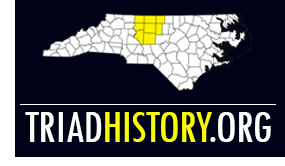 TriadHistory is a collaborative effort of libraries and museums in the Piedmont Triad region of North Carolina who have joined to provide access to digital collections of materials related to the history of the region. The project is hosted by the Electronic Resources and Information Technology Department of the UNCG University Libraries.